(If needed) Remove the service processor card. See Remove the Service Processor Card. Insert the replacement service processor card into the retainer (panel 1). 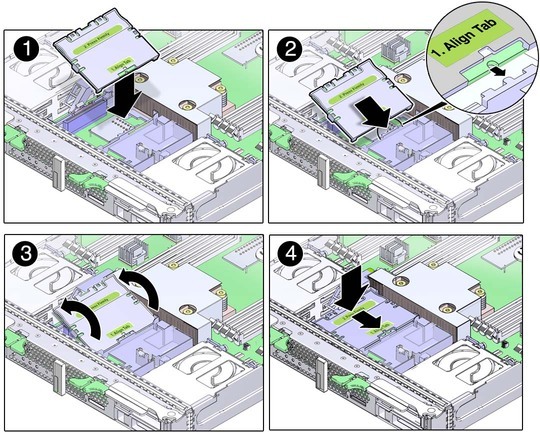 Lower the service processor card until it is aligned with the connector (panel 3). Seat the service processor card into the connector by pressing the card toward the tabs while pressing down (panel 4). When the service processor card is in place, the lever will close. Return the server module to the chassis. Access Oracle ILOM on the SP. version that supports this chassis. If you see this message, go to Step 7. Otherwise, go to Step 8. Refer to the Oracle ILOM documentation for instructions. If you created a backup of the SP configuration, use the Oracle ILOM restore utility to restore the configuration.